Spring has sprung, and now is the time to begin that deep spring cleaning. Your closets might need some organizing, and your garage over due for a purge, though you should give some love and attention to your home appliances as well. It’s time to break out the baking soda and vinegar for some environmentally friendly cleansing! Not only will your appliances look tidy and smell fresher, regular cleanings will help prolong the life of your appliance and keep it working more efficiently. Now, we are all terrible about buying condiments that we only use once or twice before they’re shoved to some far-off section of the refrigerator never to be seen again. To clean your refrigerator, start by removing EVERYTHING from the cavity and doors. Check the expiration dates on your food labels. Now is a great time to get rid of that Dijon mustard you forgot about from the cookout back in 2015. Once the expired food items are gone, you can begin washing the shelves with a vinegar and baking soda mixture. It’s a great, all-natural alternative to chemical cleaners, and will help dissolve any food odors lingering in your unit. Make sure to remove any deli or vegetable drawers and clean inside and underneath them. 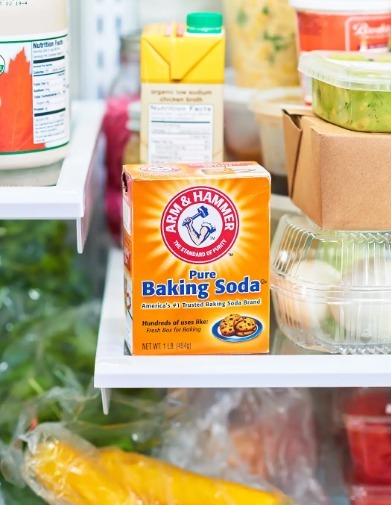 You can leave a box of open baking soda in your refrigerator to help continue to neutralize any food odors. After cleaning the inside, make sure to check the outside of your unit as well. Dust, debris, and pet hair tend to collect under and behind units. You can use a vacuum nozzle or a soft brush to clean the coils of your refrigerator. The coils are usually located on the back of the unit, or behind the filter grid at the bottom front of the unit. Dirty and dusty coils means limited airflow for your unit, therefore your refrigerator has to work harder to keep cool inside. Keeping the coils clean will help your unit work more efficiently and can extend its life. Again, vinegar and baking soda are your friend. 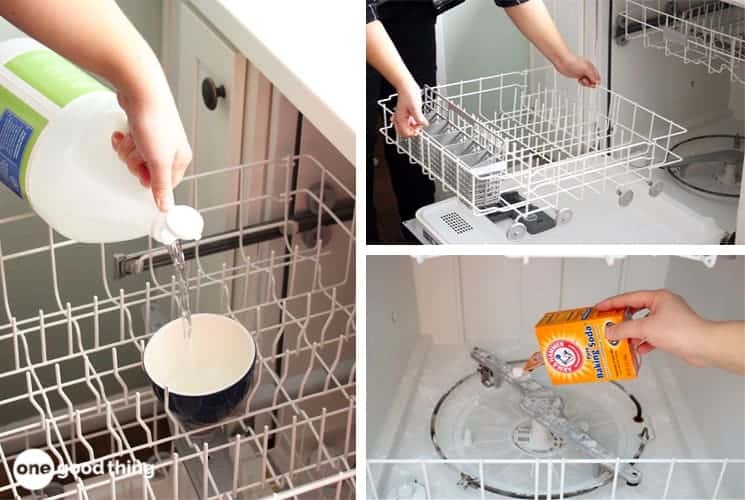 Run your dishwasher with a cup of white vinegar poured into the bottom of the unit. The vinegar will help break down food particles and will help defuse any sour odors that have collected. Make sure to empty your drain filter out as well and give it a quick wash and gentle scrub with a brush. 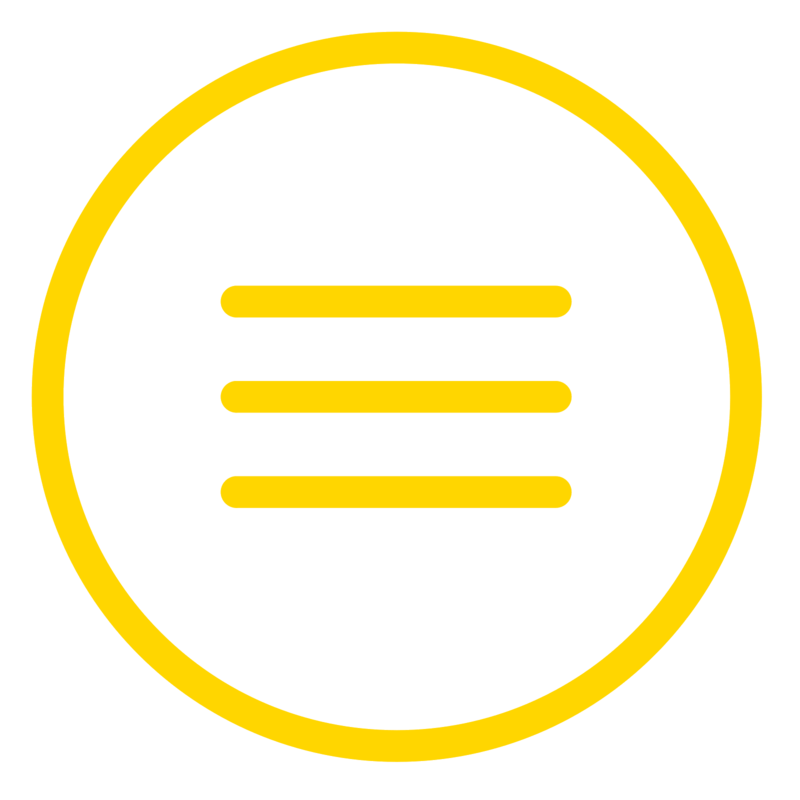 Drain filters are normally located in the bottom of your unit and are designed to keep larger pieces of food and other items from becoming lodged in your unit’s draining system. Run another short cycle, this time with a quarter cup of baking soda sprinkled inside the unit. On the top rack, sit a dishwasher safe bowl with a cup of vinegar in it. During the cycle the two will combine and gently scrub the inside of your unit, removing any residue or stuck food particles. Again, this is a nice, natural alternative to clean your unit and leave it sparkling inside and smelling fresh. The trick here is to loosen any stuck on grim before trying to scrub the unit at all. In a microwave safe bowl or cup, heat a cup of water with some fresh orange or lemon juice in it, until the liquid boils for a few moments. 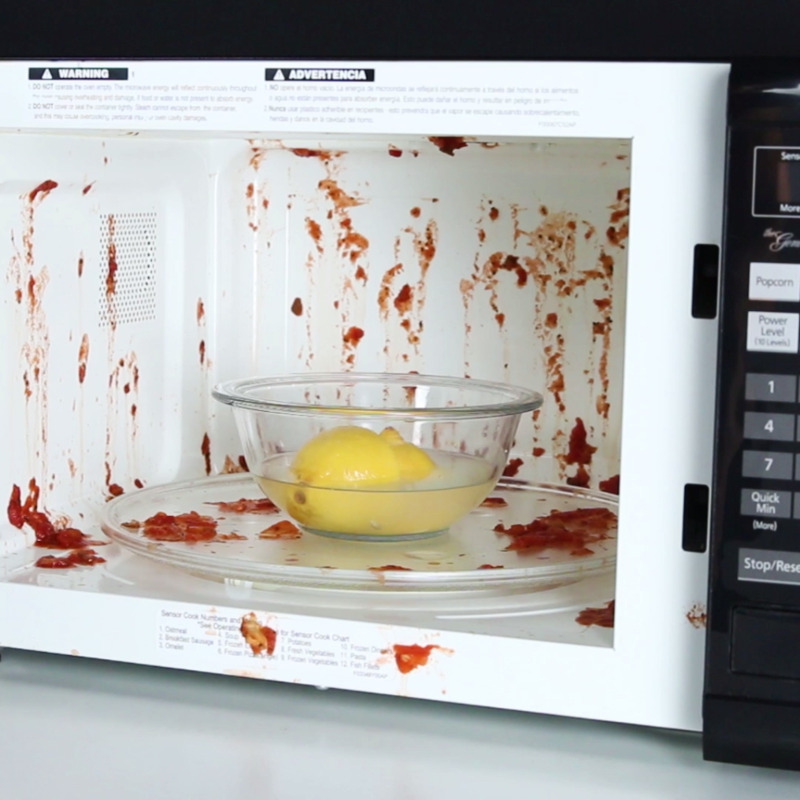 The steam from the water will help loosen any food particles or dried on splatter, so the microwave’s cavity should wipe out easily. The citrus in the water will leave it smelling clean. Once again, baking soda and vinegar to the rescue. 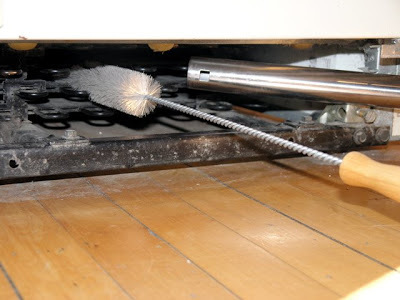 Remove the racks from your oven and sprinkle baking soda on the inside of the entire cavity. 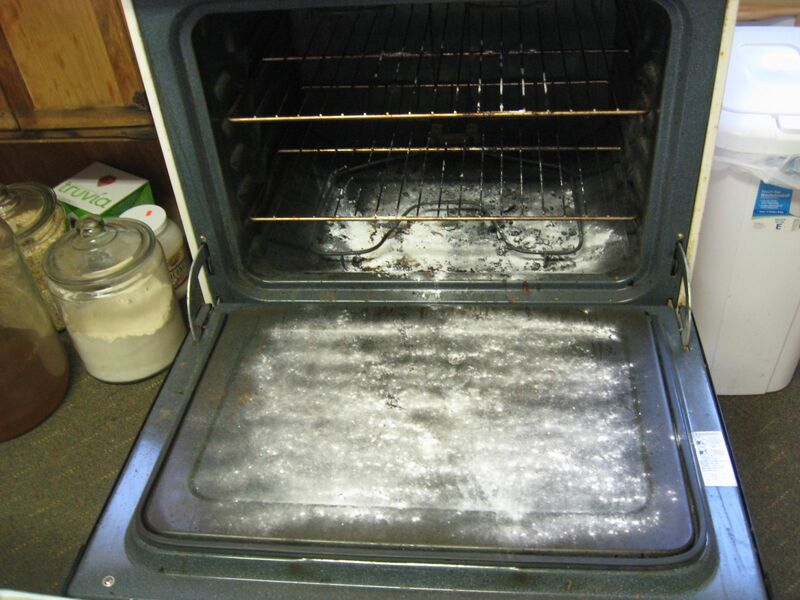 Using a spray bottle, apply vinegar to the baking soda and close the oven door to allow the mixture to react and bubble and foam. This will naturally loosen stuck on grime and grease without any harsh chemicals or fumes. While the baking and vinegar mix bubbles in your oven, you can use warm soapy water to wipe down your stove knobs and back-splash. If you have removable burners, you an submerge them in a vinegar and baking soda mixture and let them sit a while before rinsing them. If you have a glass cook-top, take care to gently wipe down the unit’s surface. DO NOT use any harsh or abrasive brushes or scrubbing type cleaners. They can scratch and damage your cook tops surface. 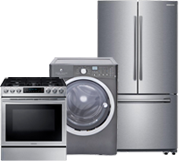 Like any frequently used and operating machine, your appliances need routine care and maintenance. Thoroughly cleaning them on a regular bases will not only keep them new looking and clean smelling, it can also help lengthen their operating life span and keep them running more efficiently and effectively. 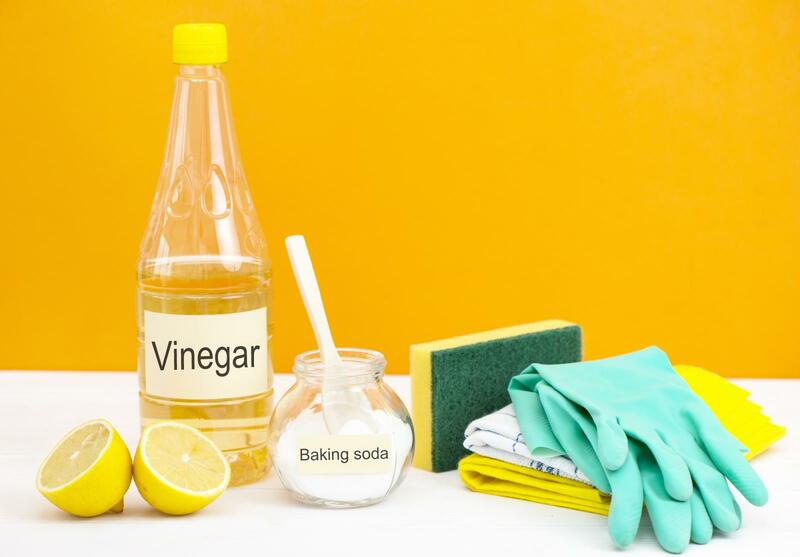 So pick up some baking soda and vinegar next time you’re out, and tidy up your kitchen the natural way and leave your appliances feeling fresh! 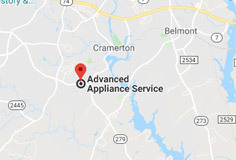 If you need service for one of your appliances, please do not hesitate to call us at 704-588-1900 to schedule service or click here to schedule online.